The Crescent-class currently acts as Starfleet's primary fighter support and was phased in during the Valkurak War to replace it's ageing predacessor. Modular ports for additional cargo/standard torpedoes/other equipment. Produced by Sukhoi-Avro's advanced projects division on Menelaus III, the type has undergone continued development even before the first Mk I prototype flew. Only three Mk I craft were ever built, and it was decided they were not suitable for combat on the grounds they lacked adequate protection for the pilot, and were deficient in regard to redundant backup systems. Eventually the Mk V was cleared for production, but at a compromise. The Mk V was heavier and slower than the Mk I. To counter this, the Mk V has an extremely versatile weapons/sensor package. It also has an extensive countermeasures system or "shroud" to make it difficult to target in combat. Crews were delighted with the Mk V since it was a quantum leap ahead of the old Katana-class scout fighter. The designers and engineers back at Menelaus were still not satisfied with the compromises and started investigating diverse concepts for the craft. The Mk VI was stripped of its warp drive and provided with a scaled down version of a Klingon Bird of Prey drive. The results were impressive at impulse speeds, but the subspace performance was halved. The Mk VII returned to the Mk V drive and festooned the hull with hardpoints to carry torpedo ordinance externally. This left room for a full scale phaser cannon to be installed, making it the heaviest hitter of the line by an exponential margin, but it also quadrupled the sensor cross-section of the craft making it a target to larger ships beyond the Mk VII's sensor range. The Mk VIII stripped both the impulse and warp drive in favor of a singularity powerplant designed by Mikoyan-Fokker. The Mk VIII was also adapted to carry a cloaking device. 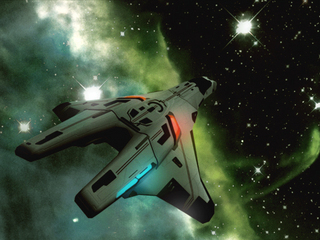 Surprisingly, the Mk VIII was the only Crescent ever to achieve warp 9+ speeds while still maintaining both the weapons load of the Mk V and the beautiful handling of the Mk I. SCE canceled the Mk VIII after only two prototypes were built on the grounds the singularity system was unsuitable for fleet deployments. It is suspected Mikoyan-Fokker drew inspiration for their design from captured Romulan craft and the decision to cancel the type was a political one rather than a safety issue. The Mk IX originally intended to utilize the singularity system to produce a heavier hitting craft, but the cancellation of the Mk VIII sent the designers scrambling for another concept. Menelaus engineers came back with three different drives from two sources. The Mk IXA had a warp drive derived from a racing craft and proved to be the best navigational concept of the line. The Mk IXA could cruise at warp 8 and make very precise correction in its flight plan (within two centimeters accuracy after a maximum test run of over 20,000 light years) unfortunately the Mk IXA was hopelessly complicated and difficult to maintain. Every hour of flight time required a minimum of three weeks in man hours to service and repair the drive. Even Menelaus engineers threw their hands up in disgust on the thought of sending them into the Fleet. Fortunately the other two concepts were not so troublesome. The source of the other two drives came from Neptune Space Yards and the workshop of the Thunderchief Project. At the time, the project was testing a refined transwarp drive from the Snow Fox fighter on their new Thunderchief Epsilon. Unsatisfied with the results they were getting, they happily turned over their designs to Menelaus while they worked on the Phase Drive that would eventually be used on the Thunderchiefs. For good measure, Neptune also sent along a Phase Drive Mk I in the hopes Sukhoi-Avro would find it useful. The Phase Drive was installed but never tested on the Crescent-class Mk IXC. It wasn't needed. The Mk IXB was fitted with the transwarp drive and had a reduced armament to fit the system. The new type could cruise at transwarp 7 and outrun everything but Stygian-class cruisers in an emergency. The Neptune engineers had also made the drive extremely durable. Menelaus thought they had finally produced what they were looking for since the failure of the Mk I and spit out 200 of the craft before any orders were placed. Inexplicably, SCE stepped in again and canceled the type. A hybrid fighter called a Binary was proposed by Neptune Space Yards shortly after the Mk IXB was successfully tested. The concept involved attaching docking shackles to a Mk V and a Mk IXB so that both fighters could use their drives to full capacity rather than cramming both systems into the same frame. It is perhaps the most versatile fighter of the line and operational testing of the concept had Menelaus preparing kits to ship out to the Fleet along with the Mk IXB. In practice, the two craft can break apart to fight individually or join up to utilize their individual drives for warp or transwarp travel. Since both craft can use their drives individually or docked into Binary mode, the type is extremely versatile and capable of dazzling tactical advantages. The concept was canceled along with the Mk IXB, but the man who developed the concept on Neptune, Chief (then Lt. Commander) Hertzog, has no problem producing the type for whoever asks for it in Starfleet. Starfleet and SCE has continued to order Mk V ships and disdained the latter types. It is thought the Mk XIV may enter production, but only after a weapons load can be settled on. In reality, Starfleet is trying to discourage the deployment of large squadrons of fighters in favor of smaller numbers of larger craft such as destroyers, cruisers, and corvettes. The reasons behind this are administrative. Fighter pilots are hard to train, egocentric, and clutter up the promotion lists with officers not entirely qualified for command of larger ships or flag rank. Since only a very few ships have large compliments of fighter craft most of these officers spend their careers in limbo aboard space stations and outposts. Starfleet strategists would prefer a large fleet of ever larger ships to protect the Federation, but they are grudgingly allowing the fine line of Crescents to be produced when their Captains insist upon them.